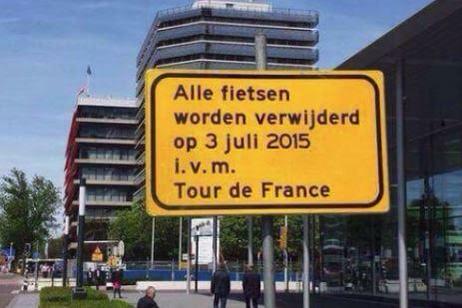 Few events draw as much attention to cycling as the Tour de France. Lance Armstrong—love him or hate him—did wonders for bringing Americans from all walks of life into cycling; the lure included more people cycling in lycra, but also for city (utilitarian travel) purposes. A rising tide for all (of cycling) usually buoys both sport and city cycling. In many conversations, the two are undifferentiated, even though they demand wildly different infrastructure and (often) draw from different cultures. But there are conditions when the two clash or don’t exist harmoniously. I am thinking of: (1) cycle ways with speed restrictions (slower cyclists don’t like the fast ones whizzing by), (2) image issues (at least in the US) of “requiring” lycra to bike to work, (3) excessive gear requirements (e.g., special shoes, coats, types of bikes); and of course (4) the helmet debate (considered imperative for cycling for sport—even in the Netherlands—but never for city cycling). There are other examples where the two clash. 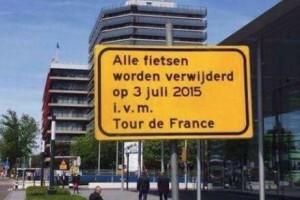 Utrecht (the Netherlands) will be hosting the first stage of the Tour de France on July 4 and one dimension of the clash between sport and city cycling is front and center. The city is banning all bicycles along the route for safety and other reasons (i.e., parked bikes or other, apparently). Cycling for sport trumps city cycling, even in the Netherlands; at least in this instance.